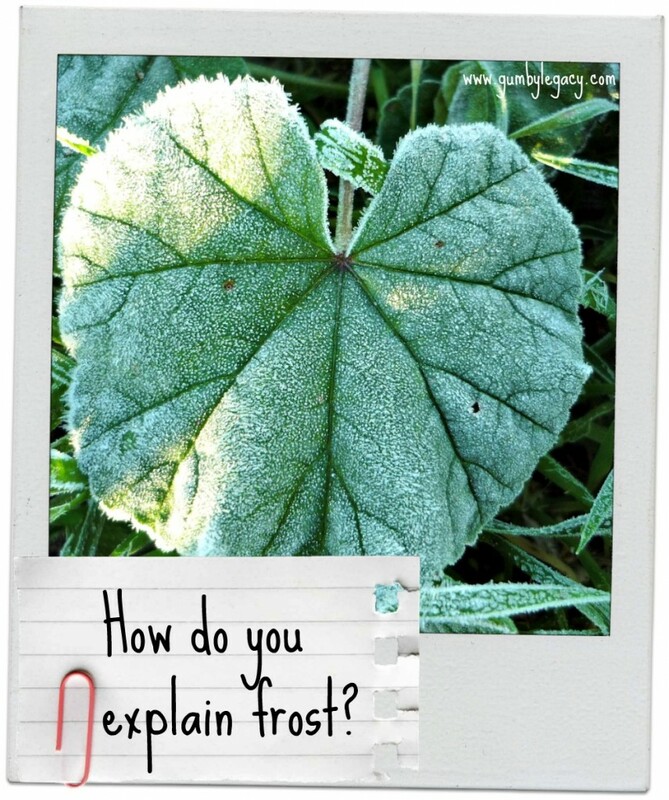 You are here: Home / Loving Nature / How do you explain frost? Winter is well on its way over here, bringing with it much beauty and interesting natural occurrences. First of these to appear and have to explain to my inquisitive three-year old has been the frost on the car the last two days. Hmmm – ‘’it’s ice because it’s gotten so cold outside and that’s why you have to wear a hat, coat and boots! You don’t want to get all icy too, do you?’’ She found it hilarious that I was pouring water from the kettle (not hot!) on the car windows and then went round scraping them so she could see out of them again. I seem to have gotten away with it so far but so that I’m better prepared next time she asks and if that’s just not enough to satisfy your family’s curious inquirer, here is a little bit more by way of an explanation and a very cool looking experiment to try making your own frost! Water comes in three different forms – liquid like drinking water, solid like ice cubes, and gas or vapour in the air that you can’t see. When it gets really cold, below freezing (0°C or 32°F), water vapour can freeze to become snowflakes or frost. There are two ways frost can form which this article regarding frost and gardening explains really well and, there are four different types of frost would you believe? Air below 0°C, measured at a height of 2m, is known as air frost while ground frost is when the air 5cm above the ground falls below freezing. The pretty ‘winter wonderland’ layer of ice that covers everything after a clear, cold and chilly night is actually known as hoar frost. Hoar frost only happens when the air is supersaturated which means that the relative humidity is more than 100%. Interlocking ice crystals form ‘feathers’, ‘needles’ and ‘spines’ and can be so thick as to look like a layer of snow. This white or silver frost can form on any object exposed to supersaturated air below freezing temperature. Supersaturated air causes dew to form so, frost is generally speaking, dew that has either frozen as temperatures have dropped, or dew that has formed on objects which are already at freezing temperature. The last type of frost is black frost and this is (unsurprisingly), a thin sheet of frost without the white colour! This can often cause a road hazard and is most common in places where there is regular rainfall and when temperatures hover unpredictably around 0°C. No awards for guessing why it’s such a regular feature in Great Britain! Salt is an effective de-icer and this is why ‘gritters’ do the rounds and why there is a yearly concern and debate regarding the stockpile and availability of salt to last the winter! While salt is helpful in preventing accidents, it can cause substantial damage to both roads and vehicles but I think I’d rather that than sliding down a hill into a wall or somebody else’s car, thank you very much! Not only cars and roads are damaged but frost can cause substantial damage to plants and crops as well. The water inside the plant cells actually freezes, causing damage and rupture of the cell walls. This is why gardeners do well to protect their plants when they know a frost is expected. In much the same way, brickwork, windows, doors, and other outside objects, can be damaged by a severe or extended period of frost. We won’t even go into frostbite to people now but if you are interested, you can read all about it here. Well, I now feel a bit more prepared to give an answer if one is required although I think she’ll probably be happy enough helping me to get rid of it rather than wondering how it got there just yet! Were you prepared for Jack Frost this week or did he take you by surprise? Or maybe you have not seen him at all yet? Wow ! I hope she isn’t ready for the facts of life about frost for a long time yet! Her Great Grandad told me when I was little and asked the same sort of question, that in the Winter, when the flowers are all asleep and the trees have lost their leaves Jack Frost comes around to make the gardens & parks & houses sparkle with beautiful patterns which will cheer everyone up! But you do have to make sure that you aren’t outside when he comes calling or he will cover you in frost too & nip your nose & toes…. I always take a moment or two to admire his work before scraping the car windows.